[News/Media] Breast Surgery Academic Exchange With Vietnam Medical Team - 짱이뻐! Breast implant company, Allergan has visited Wonjin Plastic Surgery Clinic Seoul Korea with five Vietnam Medical Team members. The aim of this visit was for the academic exchange of Korea’s breast surgery skills and cases, as well as, observation of operation. The Academic exchange proceeded with lecture materials on breast surgery, Q&A, and observation of operation. The lecture on breast surgery was carried out by surgeon, SunGeun Gwon. He mainly focused on the information, surgical method and clinical cases of teardrop implants. The lecture exceeded expected schedule due to Vietnam Medical Team’s enthusiastic interest and passion. After the lecture, observation of the operation was progressed. According to Allergan, the Medical Team from Vietnam think highly of Korea Medical team’s aesthetic plastic surgery skills, and their interests were high on having the opportunity to observe the operation. Once the observation was finished, another session of Q&A was organized. Multiple questions were asked, such as implant insertion skills, areas of incisions, hemorrhage, sizes and shapes. 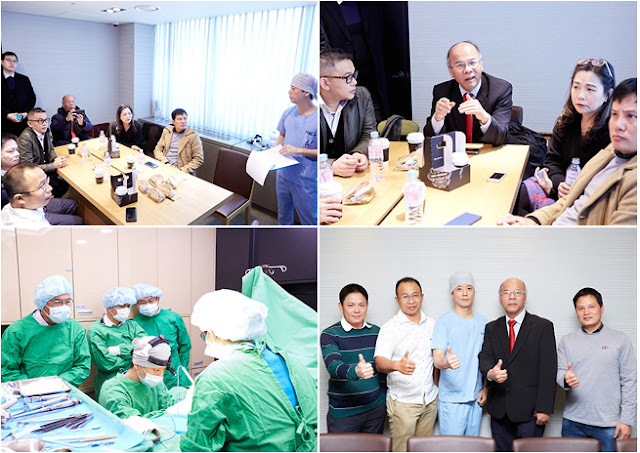 Surgeon SunGeun Gwon provided sincere answers and shared his knowledge about breast surgery with Vietnam Medical Team, and the Academic exchange ended with great positive responses. Early this November, there was another visit from a Member of Australian Society of Plastic Surgery, and Academic exchange was progressed with breast surgery specialists regarding Surgical Performance.